Albuca setosa large (Hyacinthaceae). Indigenous to South Africa where it grows widespread. 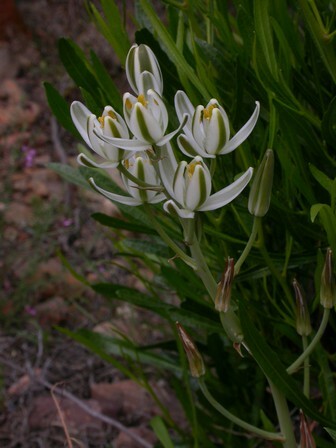 White, upward facing flowers have a broad green stripe along the middle of each petal. Fleshy, bright green leaves emerge with the flowers in the spring and die back in the fall. Sowing : Sow in trays, pots, etc of good seed compost in a propagator or warm place to maintain an optimum temperature of 20-25C. Cover with peat or sand. Locality: Bloemfontein. Harvest: September 2018.